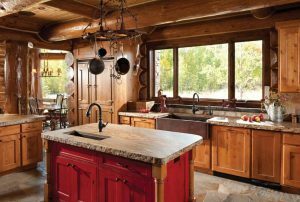 For many people, getting a new kitchen is one of the most exciting parts of building a new log or timber home. Considering how much time we spend in them, this is not surprising. Because it’s such an important space, planning the kitchen is worth the time and research it takes to ensure that it functions comfortably and efficiently. Keep these ten design considerations in mind as you plan your kitchen. Whether you are 7′-0″ or 4′-5″ the cabinets need to fit you. Base cabinets are 36″ standard height, but most manufacturers can modify the height if necessary to make it comfortable for you when you are in the kitchen working. Wall cabinets also come in various heights, so make sure that you can reach the shelves. Even if you go with a standard height you can lower or raise the placement of the cabinets to accommodate your height. Everyone knows the standard kitchen appliances: range, refrigerator, dishwasher, but there are many more appliances out there. You can go with commercial size appliances if you have a family the size of a football team or you can get apartment size appliances if it is just one person. There are also warming drawers, steamers, and a variety of specialty products that you can choose from. Just make sure you get what you need and want. The biggest reason people remodel their kitchens is for more storage. As you are designing your kitchen, ask yourself what you need to store. Do you need access to your five mixers? How much food storage do you need? Do you want a special place for Grandma’s china? If you can make a list of exactly how much you want to store and why, when you are designing your space you can make sure that nothing is left out. Just because your new kitchen is pretty doesn’t mean that it functions well. Make sure it works for your family’s lifestyle. If you entertain a lot, space for everyone to help, or having the kitchen open to an adjacent room, would be ideal. If your family eats in the kitchen, make sure there is a place for them to sit and stay. Also, keep things you use on a regular basis close at hand. If you have to go to the pantry every day for your cereal bowl, you won’t be happy. See how you use your space now, and make notes of where things could be better. As you design your new kitchen you are going to hear a lot about the work triangle. The work triangle is a set distance between your sink, refrigerator, and range. 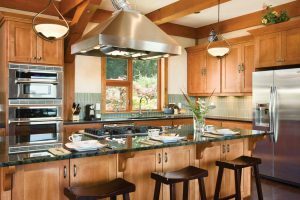 The National Kitchen and Bath Association (NKBA) has specific guidelines that you can follow to create an efficient triangle. Keep in mind that you want to have those distances relatively short. You don’t want to have to walk a mile to your sink when you need to fill a pot with water. You probably have an idea of what you want your new kitchen to look like, but not everyone does. The style of your cabinets can make a big impact. If you want to have a more contemporary look, try slab or shaker style doors. If you want a more traditional look, raised panel doors will achieve it. Color also plays a key part here. 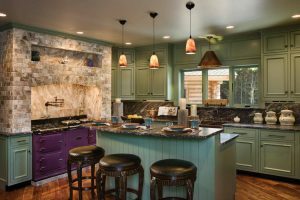 Darker colors can feel more modern, while a painted white kitchen can be more country. Keep in mind that you want something that won’t feel outdated in five years. Cabinet hardware is jewelry for the cabinetry. It can be big and shiny, or simple and understated. It can also help you say your cabinetry is modern or traditional. Cabinet hardware is not a requirement. Just think about who will be using the kitchen on a regular basis and what works best for them. Also, if you are going to live in this house far into your golden years, make sure you pick something that will work for aging hands. Handles or pulls are better than knobs. The countertop options on the market today are far too numerous to list. As you are assessing products make sure that they fit your needs. Countertop design considerations include: Do you want to have to seal the product annually? If it scratches, can you fix it? How do you clean it? Most manufacturers list all of these answers on their websites, or a professional can direct you to the best product for your needs. Budget plays a big part of most decisions. Can you afford to have granite or would a look-a-like be okay? Everyone would love to have a huge kitchen – one that everything you ever wanted can fit into and is the talk of the neighborhood. Ask yourself if you are willing to take space from adjacent rooms to make your dream kitchen. If not, maybe a different layout can make the space feel bigger, or pushing the wall cabinets to the ceiling will give you the extra storage needed. There are so many extra details that you can bring into your new kitchen that it’s hard to choose what to pick. Additional design considerations include the addition of crown molding, or columns and faux door panels on your island. All of these options can be a beautiful addition, just make sure that they fit into your budget as well. 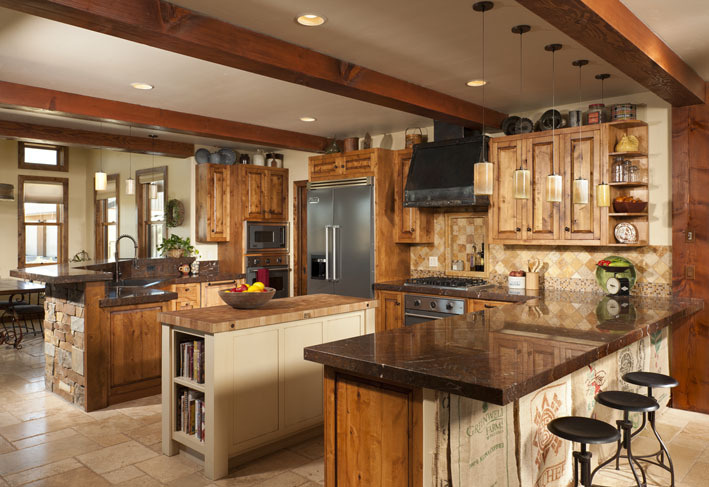 Check out these beautiful and functional kitchen designs from PrecisionCraft.